for the observations . Fitting this model with the REG procedure requires only the following MODEL statement, where y is the outcome variable and x is the regressor variable. For example, you might use regression analysis to find out how well you can predict a child’s weight if you know that child’s height. The Class data set used in this example is available in the Sashelp library. The variable Weight is the response or dependent variable in this equation, and and are the unknown parameters to be estimated. The variable Height is the regressor or independent variable, and is the unknown error. The following commands invoke the REG procedure and fit this model to the data. Figure 85.1 includes some information concerning model fit. 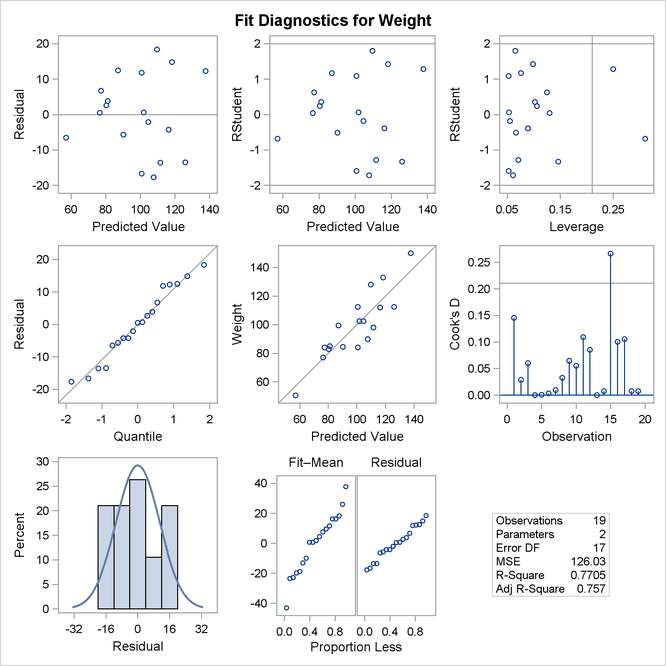 The F statistic for the overall model is highly significant (F = 57.076, p < 0.0001), indicating that the model explains a significant portion of the variation in the data. The degrees of freedom can be used in checking accuracy of the data and model. The model degrees of freedom are one less than the number of parameters to be estimated. This model estimates two parameters, and ; thus, the degrees of freedom should be 2 – 1 = 1. The corrected total degrees of freedom are always one less than the total number of observations in the data set, in this case 19 – 1 = 18. Several simple statistics follow the ANOVA table. The Root MSE is an estimate of the standard deviation of the error term. The coefficient of variation, or Coeff Var, is a unitless expression of the variation in the data. The R-square and Adj R-square are two statistics used in assessing the fit of the model; values close to 1 indicate a better fit. 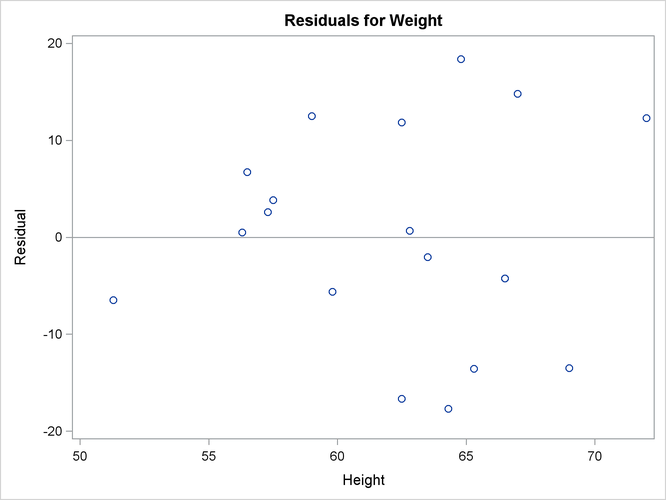 The R-square of 0.77 indicates that Height accounts for 77% of the variation in Weight. The "Parameter Estimates" table in Figure 85.2 contains the estimates of and . The table also contains the t statistics and the corresponding p-values for testing whether each parameter is significantly different from zero. The p-values (t = –4.43, p = 0.0004 and t = 7.55, p < 0.0001) indicate that the intercept and Height parameter estimates, respectively, are highly significant. If ODS Graphics is enabled, then PROC REG produces a variety of plots. Figure 85.3 shows a plot of the residuals versus the regressor and Figure 85.4 shows a panel of diagnostic plots. A trend in the residuals would indicate nonconstant variance in the data. The plot of residuals by predicted values in the upper-left corner of the diagnostics panel in Figure 85.4 might indicate a slight trend in the residuals; they appear to increase slightly as the predicted values increase. A fan-shaped trend might indicate the need for a variance-stabilizing transformation. A curved trend (such as a semicircle) might indicate the need for a quadratic term in the model. Since these residuals have no apparent trend, the analysis is considered to be acceptable.